Eva Colberg wants you to gather up a group of your friends, settle down on a long, wooden bench at the Urban Chestnut Brewery and crack open a well-hopped brew. That beer – it’s for science. The happy-hour vibe, the University of Missouri–St. Louis biology PhD student hopes, will make the difference for Science Distilled, a bimonthly event Colberg founded with fellow PhD student Emma Young. The program alternates with and is based on the formula of Astronomy on Tap: two informal 15-minute science talks broken up by trivia and drinks. UMSL’s Whitney R. Harris World Ecology Center, where Colberg is a graduate assistant and researcher in the Marquis lab, helped get Science Distilled off the ground with a sponsorship. Bringing digestible science to people and empowering scientists to do so is such a sizable part of Colberg’s thoughts that she regularly calls it out ­­in one form or another. It’s an element or an aspect or a component – but it’s always the “human” part of science. To that end, Colberg helped organize a science communication workshop in lieu of the Biology Graduate Student Association’s traditional research fair last semester and has taken up the mantle as the first Harris Center social media/outreach graduate assistant, a position tasked with building awareness on campus. She’s at work creating a backlog of student feature content including fieldwork photos as well as website improvements and campuswide posters. She hopes, ultimately, to see more undergraduate involvement. Colberg got involved and interested in ecology thanks to an upbringing in Alaska. Growing up outside of the major cities, she spent a lot of time outside, where it was “wonderful but cold.” She initially thought she’d be on the policy side of conservation and, as a high school senior, did an internship with Sen. Lisa Murkowski. 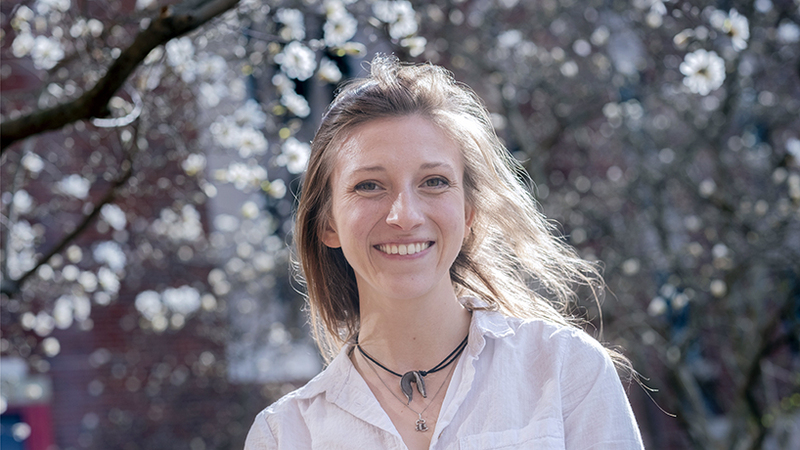 As a freshman, Colberg signed up for an introductory ecology, environment and ecosystems course thinking that having that background knowledge would enable her to be a more effective policymaker. Turned out she’d inadvertently signed up for the biology program’s weed-out course. Studying abroad in Madagascar with the School for International Training cemented her decision to study ecology. While there, Colberg took note of the multiplicity of Missouri Botanical Garden field sites that employed the Malagasy people for nurseries, research, planting and extensive community-based programs. In her post-college gap year, which she dedicated to field jobs and graduate school applications, Colberg found herself working for the Missouri Ozark Forest Ecosystem Project and living in the Ozarks. She started volunteering for the Litzsinger Road Ecology Center, which is owned by the Missouri Botanical Garden, and started wondering about nearby graduate programs. St. Louis was a simple 2 ½ hour drive – nothing to an Alaskan – so she commuted up to see if there was any way to get involved with the garden and go to school locally. “UMSL really seemed like the best fit,” Colberg said. “I’m broadly interested in plant/animal interactions, and we have several labs that are doing that so, in my mind, it was the only place in St. Louis that seemed attractive. At UMSL, Colberg started her doctorate in her advisor Robert J. Marquis’ lab. Her research explores how Missouri ants disperse the seeds of spring ephemerals: plants that bloom quickly then the above-ground parts fade, leaving the roots alive. She’s investigating how land managers’ burning regimes, an essential aspect of fire ecology, affect seed growth. By examining burning in different conditions, Colberg hopes to discover the fate of a seed under any fire circumstance. For the other part of her research, she will be talking with land managers to unpack their terminology and thinking processes in order to possibly propose a unified language. So that any one manager will be able to effectively communicate with any other. Science communications – it’s a theme. Communication isn’t her only touchstone, however. She recently sat down with Marquis, who asked Colberg what motivated her and her research: ecology, evolution or something else? The answer jumped to Colberg’s mind immediately.